"What's the point of being more social?" "I'm not currently a very social person, and I like my life just fine. I don't feel like I'm missing out on much. Why should go to all the trouble of working on my people skills?" "I can see some benefits to being more social, but the process of improving seems like it will be discouraging and difficult. What makes it worth it?" This article will be my attempt to address this tricky question. Like I said, I realize a lot of the site's readers are down with the idea of changing socially, so I won't preach to the choir and write something that speaks to their sensibilities. Instead I'll cover the issue with a focus on the perspective of someone who's more skeptical about the point of being social. Before I start talking about some possible reasons someone may want to be more social, I want to say that I'm not trying to change anyone's mind. Sure, I have my own biases. It would be disingenuous to pretend otherwise. Personally I think for most people learning to be more social can make their lives more fun and rewarding. However, I think everyone should make their own decisions what would work best for them. I don't think it's my job to try to sell you on any particular path. Even if I wanted to try to force my opinion on you, I don't think I'd have the power to. There are no magic arguments I can make that could totally sway your viewpoint. The value of socializing is something you have to want and experience for yourself. It's not a matter of hearing some logical arguments and deciding to feel differently. As I've written before, it's fine if someone isn't as social as everyone else. It sometimes makes life a hassle, but there's nothing inherently wrong with it. It's also okay to question the value of socializing. Maybe you're on the fence about being more social, and you'll decide it's just not for you. And maybe you'll never look back from that decision. Or you could be in a different headspace a few years from now. It's all good. There are a lot of common reasons out there for why someone should be more social. Farther down I'll get to the few that I think are more valid. First I want to talk about the ones I've heard that didn't do much for me. It comes across as logically telling people how they 'should' be, without providing any real reason for why they would want to change. So what if there's some piece of information that says humans are social creatures? That doesn't mean every last person on the planet is now obligated to act the same. Humans have free will and can choose to act against their broader make up and instincts. Like it may be 'natural' for people to eat meat, but many decide consuming animals is against their values. People naturally vary along all kinds of dimensions, and some of us just seem to be less wired towards being sociable than others. Yeah, we may be a social species on the whole. You could even say the majority of people are quite social. But that doesn't mean every last individual is. While this statement is also valid, it makes socializing sound more like medicine or broccoli than anything. Not many people are going to change their social habits just so they'll be less likely to die of heart disease decades from now. If they've heard this argument, someone who's less naturally social has probably decided that they can handle or offset the increased risks their lack of connections causes them. This refers to both emotional and material support. It undoubtedly feels great to have people you can go to when you're feeling sad or stressed out. When you're moving to a new place it's handy to have some mates you can call on to help you haul your couch and mattress up the stairs. If someone is less social they'll tend to see these things as something that would practically be nice to have, but with which they can live without. They figure they can always hire movers for their furniture, or handle their emotional problems on their own, or through a professional. People who are isolated and lonely often complain about boredom. When they spend a Friday night reading on the internet they're quite aware that they're partially doing it just to fill up their time. However, people who are happy with being less social usually have rewarding hobbies and laugh at the suggestion that their lives are dull or unsatisfying. Many less sociable people consciously choose to work on their people skills in order to benefit their careers. That's a decision they made on their own though. I'm referring to when this argument is being heard by someone who is more dubious about being social. To such an individual this point can make socializing seem like a game that they're being told they unwillingly have to play. It can stir up resentment in them over how the work world seems to devalue their other strengths in favor of schmoozing. They can always decide that rather than being more social when they don't really want to, they can pursue a career where they can get around a lot the usual communication skills requirements, (e.g., being a freelance, work-from-home graphic designer). Below are some points in favor of being social that I think are more valid. However, you'll notice they still aren't particularly persuasive. 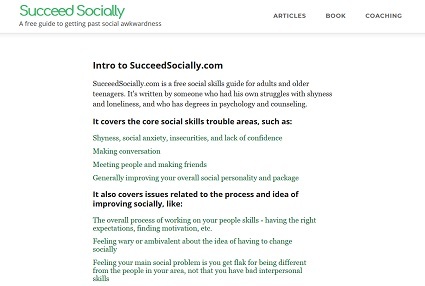 Like I said before, socializing definitely has value, but you have to find that out yourself. Having a great time hanging around with some buddies and cracking each other up with jokes all afternoon. Having a deep, interesting conversation with someone about your values towards raising a family. Connecting with someone during a discussion of the difficult times you each went through as a teenager. Being your quirky self around a group of old friends and feeling liked and accepted by them. Getting away for the weekend with your best friends, and getting into all kinds of ridiculous, hilarious adventures with them. Sharing the experience of watching a good movie with a buddy, and then trading opinions and insights on it. Being able to help a friend through a crisis, and knowing how much it means to them to have your support. I could go on and on, but I think I've illustrated my point. Again, it's not like this is something I where I can wear down your objections if I just throw another dozen logical examples at you. There are a lot of experiences that people seem wired to inherently enjoy, and they aren't comparable to each other. For example, the pleasure you get from playing a fun, yet challenging, video game isn't the same as the satisfaction of getting a massage. Or someone would never say, "Well I'm missing the joy of being exposed to stimulating new ideas, but I'll just eat a lot of tasty meals as a replacement." Socializing is the same. This is another argument that doesn't come off as entirely convincing at first. It's basically saying, "Well, you never know, you may like it if you give it more of a chance." But you could say that about all kinds of things, and that's not a reason to invest a lot of time and effort into every pursuit. However, in my experience there really can be something to this point, at least for a certain type of person. Some people are lukewarm about socializing, and they have a completely clear idea of what they're giving up, and they're comfortable with that. I think other people, particularly younger ones, aren't making as informed a decision. Their experience of the social world to date hasn't been that stellar (think of what some people go through in high school). They just don't know how much better things can be, when their relationshipss are with people who they actually like and connect with, and when they've developed their communication skills to the point where the better aspects of socializing are 'unlocked'. I touch on this idea as well in the article I wrote on how it can be hard to know what you want socially. This reason has nothing to do with any intrinsic value socializing does or doesn't have, but it does end up being a significant one in a lot of people's lives. 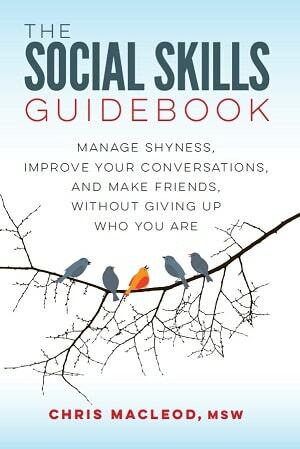 Even if someone isn't internally motivated to be more sociable, they may start working on it anyway, because there are specific things they want out of life, and they've decided they need better social skills in order to get them. Sometimes they do this begrudgingly, at other times eagerly, because they're now excited about the possibilities that socializing can bring them. At the moment there may not be an outside reason for you to become more sociable, but one may appear in the future. I talk about this more in the following article: Pragmatic Motivations People Have For Improving Their Social Skills. A quick example would be a young man who would otherwise be happy to spend all his alone inside writing short stories, but who starts attending more social events because he wants to meet a girlfriend.